I’m back talking about beans again. I hope you have been able to enjoy the magical world of beans. If you still haven’t taken the plunge (it took me 10 years! ), maybe a little more encouragement will help. I am by no means an expert on bean cookery, but here are some tips from my kitchen. Canned beans are great for quick bean additions. I usually start by opening the can, dumping the beans into a colander, and rinsing them. Sometimes when I don’t feel like cleaning the colander I just use the can to do a quick rinse. I keep the lid partially attached to use as a guard to keep the beans in the can as I dump out the bean “juices”. Then I fill the can with water, dump out the water, and repeat this a couple times. I’m not sure that is easier than just cleaning the colander, but hey, it’s what I do. Chop garlic in food processor. Add the beans and half of reserved liquid. Add peanut butter, parsley, lemon juice, pepper, and salt. Process until it forms a paste. Drizzle in olive oil and process until it is the consistency of mayonnaise. Enjoy on a sandwich, or as a dip for veggies, pretzels, or pita bread. Since dried beans are cheaper than canned beans, I am pretty much just a dried variety girl these days. I usually soak and cook a double or triple batch at a time so I can freeze extras to create a quick bean solution. Before soaking, it is important to do a quick look through your beans to make sure there are no small pebbles or other such debris mixed in. It doesn’t happen to me very often, but I do find something occasionally. You can also take out any beans that look shriveled or funny-shaped compared with the rest of the group. Soaking (6-8 hours) and cooking (1 ½-2 hours) the beans is a time commitment, but they require little attention during this process so you can easily accomplish something else while the beans do their thing. I usually soak the beans overnight and cook the next day. It’s helpful to cook tomorrow’s beans while I make tonight’s dinner. By the time I am done eating and cleaning up the kitchen, I have cooked beans all set for the rest of the week (or more if I freeze extras). This does take some planning ahead, but that is where the pre-planned menu is a big help. 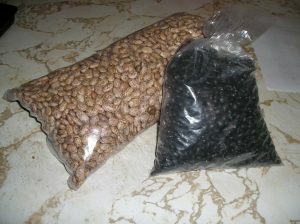 My family has found some of our favorite beans recipes on the Kitchen Stewardship blog at www.kitchenstewardship.com. Here you can even purchase The Everything Bean Book with lots more ideas to inspire you on your journey toward your personal bean goal. You may already know which food I am going to discuss just by reading the title of this blog article? If you don’t, I’ll be nice and let you in on the fun. I am going to talk about beans: pinto beans, black beans, red beans, garbanzo beans… beans. Why? Because they are good for your body, good for your bank account, and delicious to eat! While technically not a fruit, I do consider beans somewhat magical in the amount of health benefits they pack into such a small little container. They give your body protein, B-vitamins, iron, and antioxidants. They are also a great place to look for soluble fiber, which can help maintain a healthy balance of fats in your blood. I learned that beans are good for the body and the budget in college nutrition classes (about 10 years ago!). That is why I always kept a bag of dry beans in my cupboard. What I did not know was how easy they are to prepare and add into my diet, and that is why I had the same bag of dry beans in my cupboard for about 10 years. 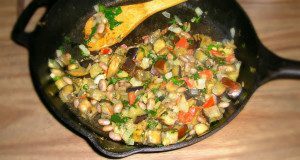 I took a new look at using beans in my cooking when I was looking for cheaper ways to provide my family healthy food. I can buy a can (about 1 ½ cups) of beans that are already cooked for $0.75-$1.50 depending on sales. If I use 2 cans in a dish to feed my family of 3 adults and 2 toddlers, that is $3 maximum for the main protein of the meal. Are you amazed? Then I looked at dried beans. I can buy 1 pound of dry beans (about 6 cups of cooked beans) for about $1, which means I spend $0.50 on the main protein of the meal. Now I was amazed and decided to add beans to our family menu at least twice a week. I try to start new habits with small, baby steps so I can quickly experience success. For my bean experiment, I chose to add canned pinto beans to quesadillas, tacos, taco salad, nachos, and chili. Thankfully, my family is not too picky and didn’t mind having one of these five dishes twice a week for a month or two while I gained confidence. To me, beans (canned or dried) are a great meat substitute or supplement because they are inexpensive, low in fat, and high in fiber. If you are intrigued and interested in trying your own bean experiment, I would suggest making a goal to include beans in your diet x times a week or a month. For me, making a menu makes it more brainless and more likely that I will follow through with my goal. Identify dishes you already eat and then see if you can add a can of beans. If you are coming up dry for ideas, try this easy and delicious one: black bean brownies. Take a chocolate cake mix and instead of adding eggs, oil, etc. add pureed black beans. Rinse one 15 oz can of beans, then add back to the can the beans and fresh water. Puree the beans and water. Add that to the cake mix. Bake as per the instructions. A delicious way to get started I would say!